Hello, today I'm gonna teach you about How to Fix Missing or Invalid Structured Data Item on AMP Blog HTML. Missing or invalid structured data item, A recent notification appears in Google Search Console for AMP that Missing or invalid structured data item on the AMP page. Whereas when we checked on Structured Data Testing Tool does not show any error data blog structure. Obviously this is instantly dizzy, confused what should be fixed because the Structured Data Testing Tool no error data structure but received notification from Google Search Console for Structured data items not exist or invalid. Of course this makes the brain think harder and make heads into migraine instantly, just kidding. The reason is simple. it turns out that existing data structures do not match the needs of AMP. For that we need to change the data structure to match the AMP's suggestion that the page has a valid AMP structured data. To correct the invalid structured data item on this AMP page, we need to change the existing data structure to the AMP's recommendation. The first thing to do is remove all schema.org elements like or similar like the following. For blog logo please create an image with size 600x60 can with format jpg, png, or gif. Then please replace the code I marked above. Once everything is done, please check the AMP data structure validation here. If it is valid it will look like the green checklist sign. 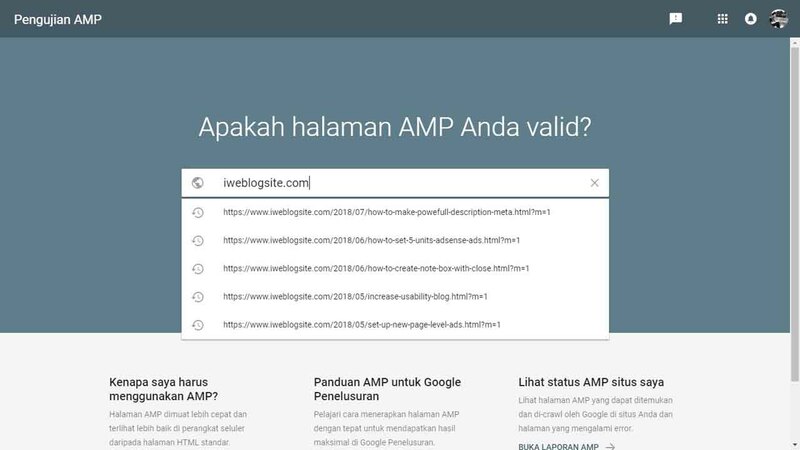 After that please do Validate Fix in Google Search Console and wait for Google to validate our blog AMP page. For AMP required a large post thumbnail at 800px range. So for the pictures for post thumbnail make 800x800 for thumbnail box or 1400x800 for square thumbnail. Ok, that's all about How to Fix Missing or Invalid Structured Data Item on AMP Blog HTML tutorial. Hope you enjoy it. Thanks for visiting this blog.